In the world, there are people having different kinds of hobbies and among these hobbies one common hobby is of photography. The people in this category loves to capture photos of the beautiful places, personalities etc they also love the make their photographs looks funny. Some of them may also want to make their photos just as it is drawn using a pencil. So for these people here are some online free tools available on the World Wide Web which converts an image to pencil sketch. If you are wondering what is meant by pencil sketch, then let me explain, it means that photos which are drawn through pencil on a page. But if you can’t draw through the pencil then it is possible if you just captured through camera using these free online tools, And it will closely looks like these are drawn by pencil in fact. As in one of our previous post we shared some free online tools to add funny effects to images and free photoshop online, which we can use in such time if we want to add funny effects to our photos. Moreover, we would like to let you know about another website where you can get some information about spray painting products, you can check it at SprayThatPaint to check all the products and read in-depth. And now here we’re going to share some tools that converts pictures to pencil sketch. Now let gets started with the online photo editing tools which gives a pencil sketch to your photos, As after we made a research for these tools, we found tons of tools but we picked and shortlisted the best of them. This drawing website is a brand new website that let's you make your own drawing online and to create your design skill into the next level by drawing. TJS home is a good variety of options to give a new look to your photos online, you can convert your photos to pencil sketch using this online tool, what you’ve to do is to click Here And then in the TJS home website. 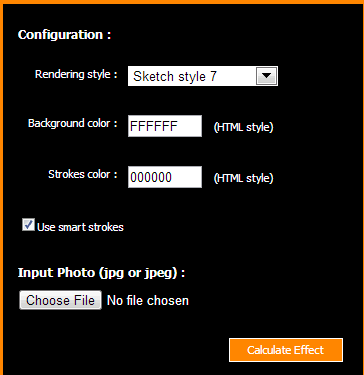 Select an output format from the available option, i.e select the sketch that is the first option in the third row. Now choose a photo from your computer by clicking on “Choose file” button, and click on submit button so you’ll get into a new page where you’ll see your uploaded picture that will looks like drawn by pencil. A famous online photoshop tool about different photos effects, which adds so many effects to your photos online. As in our previous we used it as a 3D text image generator, but here we’ll be using it as an online photo sketch tool, so to make your photo as a pencil sketch with this tool you’ll need first to click here and you can see here various types of pre-made styles from which you’ve to select one for your photo’s output. So to get started with this tool first you’ve to select an our put style from the “Rendering style “ drop-down arrow, Background color, and Html color. (you can leave it as default) and finally click on “Calculate Effect” button. so you will see your uploaded photo will be in the pencil sketch. SnapsTouch: If you’re looking for an online photo to pencil sketch tool then Snapstouch is a good choice for you because converting images to pencil sketch with this web-application is very easy. What you’ve to do is to scroll down to choose button and then click on upload button. You can visit the website by clicking here. Converting a picture to pencil sketch is very easy now with this application, this is a free online editor which converts your uploaded photos (Must to be less than 2 MB) to pencil sketch, if you love these types of pictures then you must to use this tool and see the changes. Just like the others, mentioned above, this tool allows you to add some more effects to your photos including a sketch effect, so here you can use it if you want to convert your photos to pencil sketch online. PhotoFunia – Sketch Image Effect: This is a most popular web application and photo editing tool, which adds so many effects to photos online for free, Also you can use this tool to turn your photos into pencil sketch online.so you can get started with this online free tool by going to its website. This tool is specially build for turning your photos to pencil sketch as the name implies. It has a very simple and user-friendly interface. i.e what you’ve to do is to upload a photo by clicking on choose file button and then click on upload button. After you click on upload, it will turn your picture into pencil sketch instantly. So friends, above we shared some free online tools which you can use to turn your photos into pencil sketch online, I hope you will use these and will enjoy your photos. If you like our posts them please make sure to share it on social networks with your friends. We appreciate your comments related to any post on this blog, feel free to leave your comment and tell us how our posts are... if you have any additional tool then let us know about it. I glad to see you here and you leave a comment here. Thanks for bieng here & commenting on this post!